First we need to know what mold is. It is common fungus found in musty damp areas like attics, basements and bathrooms. These areas are mostly dark and moist with very little if any sunlight with typically very stagnate air movement. Trees and plants, and yes even fibers and foams like those found in mattresses can be common places that support mold growth. Mold spores can become airborne and move through the air seeking out wet areas to multiply in not only your home but the bed you sleep in. Considering the amount of time spent in a mattress which for most of us is 7-8 hours or 1/3 of our day. This irritant could make one third of your life very unhealthy contributing or causing many problems from being a simple irritant to a severe health risk. For some mold in the mattress may be the cause of lack of rest which according to most professions has numerous additional health effects on our life we won’t even get into today. However most can set off allergies which can blow up causing major health issues that are often magnified in the form of minor to severe ear, nose, and throat problems. Lung issues such as asthma can easily be set into motion from such an irritant causing more serious health risks that could be life threatening for some. If your mattress looks or smells moldy or musty, you have any of the above symptoms or problems mentioned this could very well be a sign of a problematic mattress that needs immediate attention. So you have either found mold in your mattress or you are worried that your mattress might develop mold. Is there anything you can do? Of course there is, but first understand why mold grows in a mattress to help solve the problem. Mattresses while hyped as breathable for optimal sleep more often than not have very poor air ventilation. Inside of a mattress the air is quite stagnant and very dark, throw in the moisture found in beds and it becomes one of the most likely breeding grounds for mold. The moisture comes from a variety of sources and often can be prevented. If you enjoyed Can Mold Grow In My Mattress you will want to catch part II How To Prevent Mold In A Mattress, Click Now! I was doing a search online about mold in mattress’ and came upon your site. We purchased a Simmons Beautyrest Comforpedic foam mattress 3 years ago. a few months into our purchase we were moving our mattress and noticed mold on the bottom of it. Sleep Train replaced it for free. They also sold us a fully zipped encased mattress protector to prevent anything from happening again. We felt so confidant this wouldn’t happen again. Now 2.5 years later we were moving our mattress and discovered mold on the bottom again but it was forming on the inside of the mattress protector which tells us it’s coming from the inside out. We also have a waterproof mattress pad on top of the mattress and when you remove it, the top of the mattress is untouched. We are getting the run around from Sleep Train saying they don’t cover mold. We live in the SF bay area not the jungle. It’s pretty dry here. Our house it dry too. We are at a loss at what to do. We are sleeping on black mold!! We have 3 little boys. Purchasing a $3000 bed was a huge investment for us. Wondering if you have any advice for us. If you spill water on your mattress how do you know if there may be mold growing in the mattress or not? Is there a test you can do? Can a mattess obtain mold if a bedroom gets 6″ of water in it on Monday from a flood and the mattress is not removed from the bedroom until Friday of that week? ( the matress did not get wet). My daughter has mold on her mattress, is there a test she can take to see if her health problems is from the mold. Doug, can the mattress be cut open and then resealed by sewing etc? Is there any other way to find out if there is mold growth other than cutting it open? Your reply to Cecelia was helpful. My question is simalar : we have a situation where because I failed to repair our roof in time, some evidence of mold was spotted in ceilings and soft spots on floor. To make a long story short, it’s not worth putting the money into an almost 30 yr old manufactured home to remove the many areas of mold so we are moving into a brand new manufactured home a few doors down. I had the air tested and we failed that test. We have a fairly new king size mattress and while we haven’t stayed in the old home, due to air quality, this bed /mattress has been in the room (with bad air quality) for several weeks. 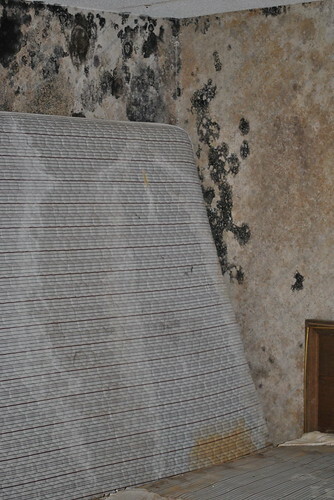 There seems to be no visible evidence anywhere of mold on the mattress and no water damage occurred at all. My question is : would there be any effects to our mattress due to the air quality ALONE. It’s clear that mold exists. This mattress is not near any mold areas. It’s only the airs effect on it I’m wondering about. I’m concerned about bringing that mattress into our new home. We’d hate to get rid of it. It has many years to it yet. What effects does airborne mold have on items such as mattresses? Where might I go to find out more info on the airs effect on house items such as chairs & mattresses? It’s difficult to get a definitive answer to questions like this. Any help is greatly appreciated. I recently discovered surface mold or mildew on my mattress. I cleaned it off but I’m wondering how long it takes for mold to grow INSIDE the mattress. If there is mold on the outside is it guaranteed to be on the inside as well? Is it a question of how long the mold has been growing, or does it spread into the inside within only a few days?